Lukas Peterson Fans Nine in Shutout Win. 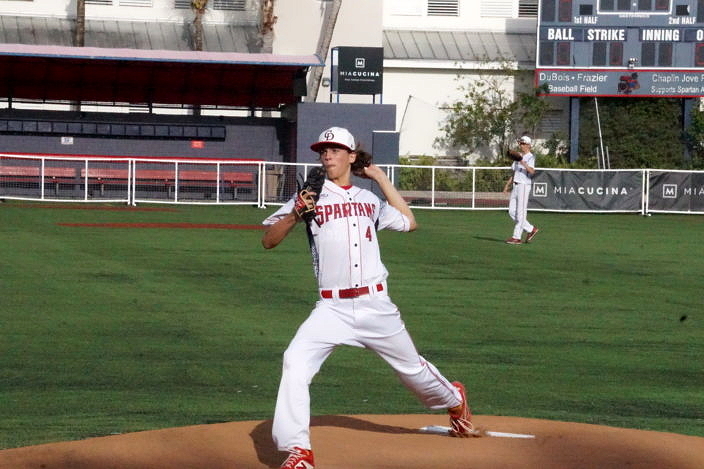 The Miami Country Day Spartans defeated the Ranson Everglades Raiders 7-0 Wednesday night, thanks to another stellar outing by sophomore ace, Lukas Peterson. Peterson continued his dominance on the mound, by tossing a complete game shutout, lowering his Earned Run Average to 0.24. Peterson got some help from his offense to make his job a little easier. In the top of the first, the Spartans pushed a run across on a sacrifice bunt by Myles Berlowitz. The Spartans tallied a couple in the third, thanks to an RBI single by Lee Laslovits, and a wild pitch to make it 3-0 Spartans. They later added two runs in the bottom of the fourth, on a two-RBI single by Zac Wyka. The Spartans brought home two more on an RBI single by Sean Finny in the fifth, and a sacrifice fly from Laslovits in the sixth. 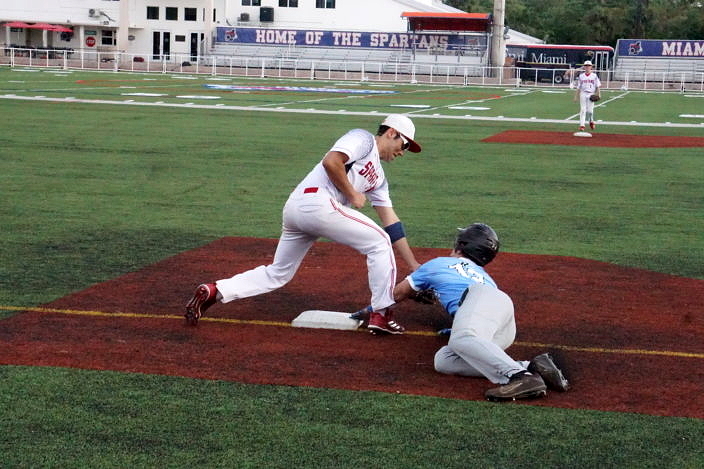 Myles Berlowitz Tags The Runner Out at Third. Laslovits said his team had a great week of practice that led to the Spartans success Monday night. “We put in the work throughout the week last week, and we were just amped up coming in,” said the Spartans first baseman. The offense was more than enough for Peterson, as he allowed no runs, on just three hits, and a walk, while striking out nine. When asked about his performance, Peterson said he kept it simple. “I just wanted to throw strikes, and trust my defense behind me,” Said Peterson. Ransom Everglades did a great job keeping themselves in the ballgame. Raider’s starter, Chris Basile, went after the Spartan bats and gave his guys four solid innings of work. The Raiders collected hits from Alex Boehm, Emmet Gershman, and Michael Segel. Boehm also made a great defensive diving play in the bottom of the fourth to bail his guys out of a jam. Ransom Everglades looks to bounce back tomorrow against Palmer Trinity, and finish their week on Thursday against Riviera Prep. As for Miami Country Day, they are back in action on Wednesday against Krop, and Marathon on Thursday.